This was a great 'leftovers' meal and because I have been pretty vigilant in meal planning and trying not to waste food I'd planned this in and it worked out really well. It also seems to be the sort of recipe that you could change depending on what you've got in the fridge with a few added pantry items. I think you could adapt the amount if cheese, I just used what I had left so there might have been a bit more than a recommended portion or those counting calories. I also used 5 sun dried tomatoes but to be honest I think it would have been better with less. I served with sugar snaps and roasted baby potatoes. It was delicious, I think I'll try something similar wrapped in foil on the BBQ! Scrape the seeds from the courgette, chop and fry lightly in olive oil with the shallot. Combine all other ingredients, when courgette and shallots are soft add those to the feta mixture. 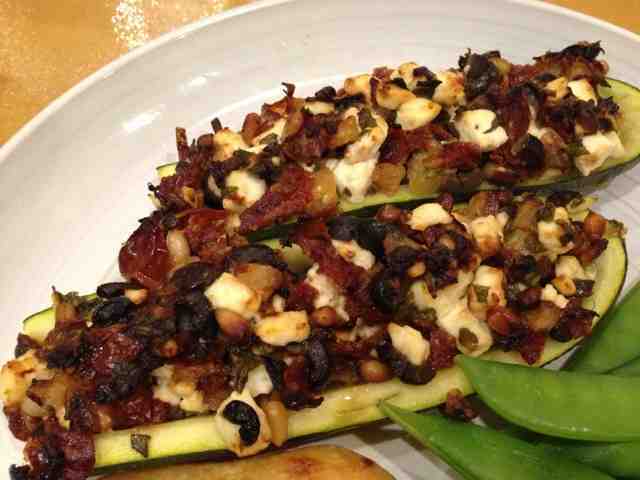 Fill the courgettes with the mixture and bake for 25 minutes.